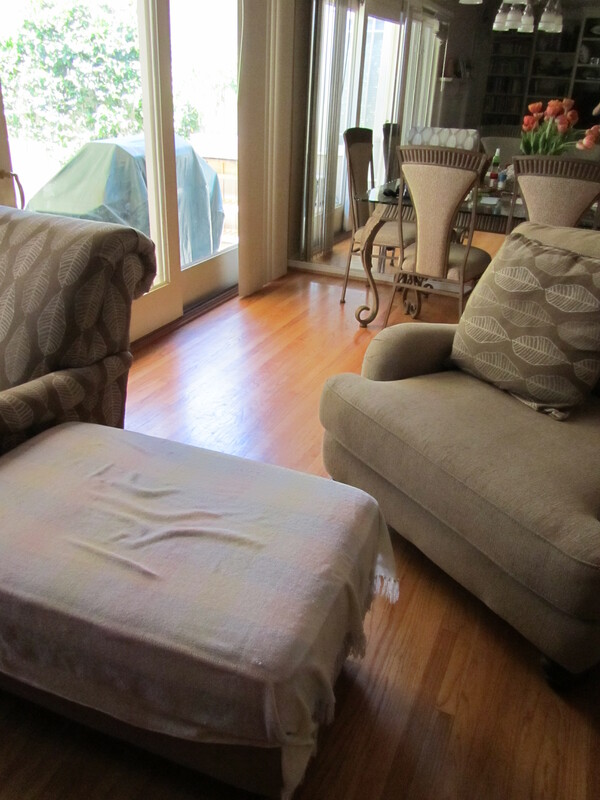 Hey, who moved sofas around? I cannot walk through! Kinta has a tunnel vision when he’s playing with his ball. 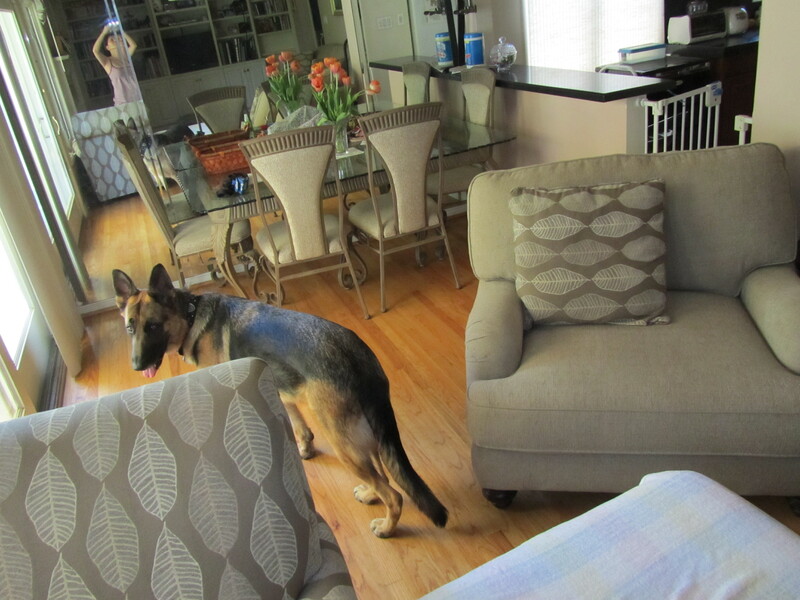 He elbows his way through sofas to find his ball. Bulldozer dog! 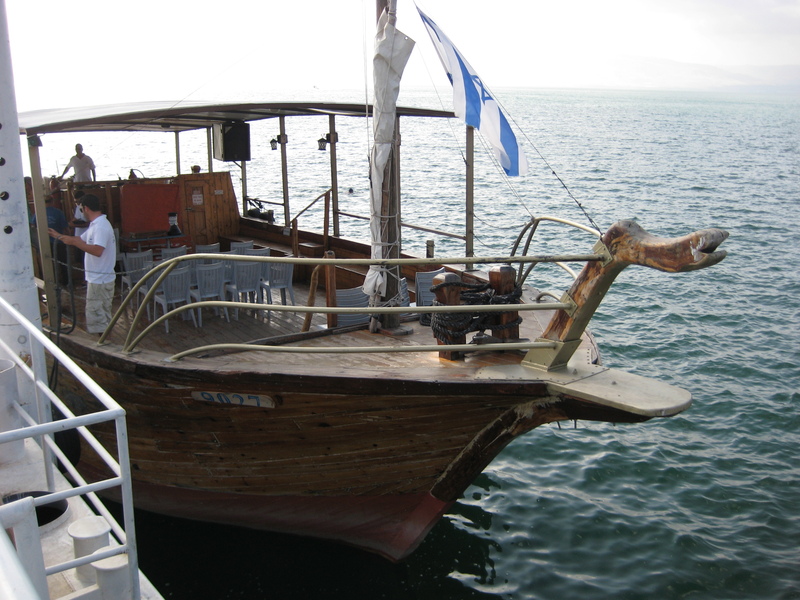 First we stayed in Tiberias by Sea of Galilee. 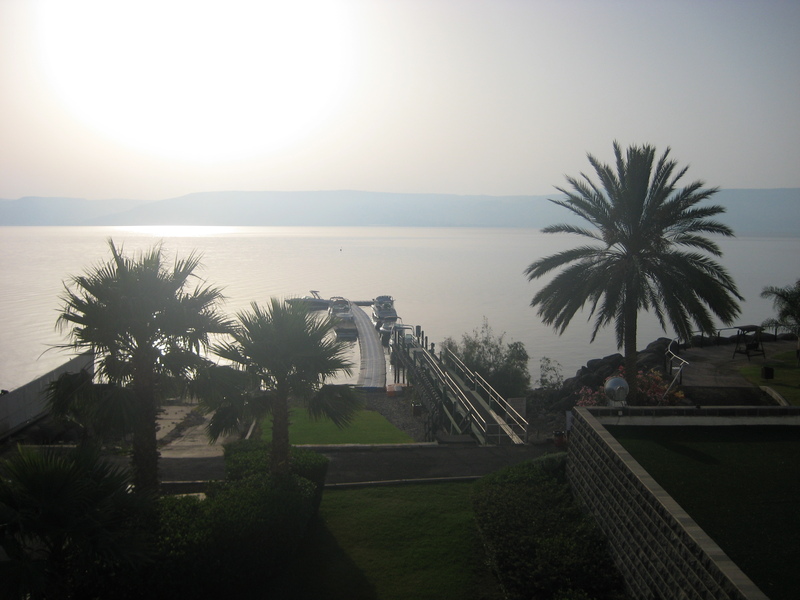 Sea of Galilee a.k.a. 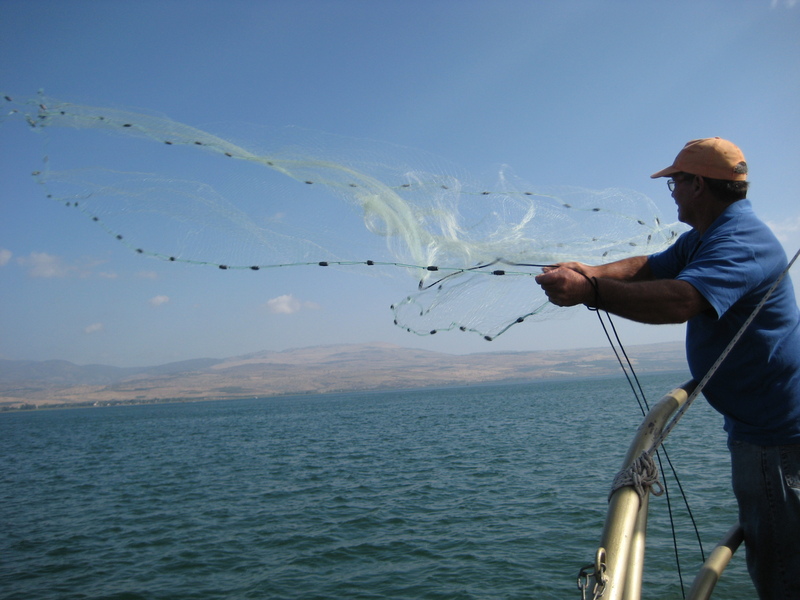 Kinneret is freshwater lake max. length 13 miles, max width 8.1miles. 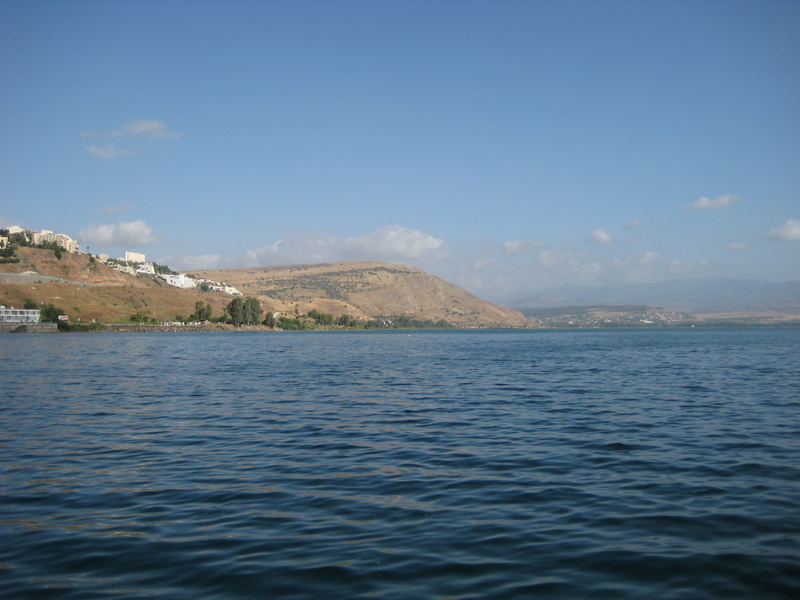 There are so many places to visit around Kinneret but we tried boat cruise in the morning. 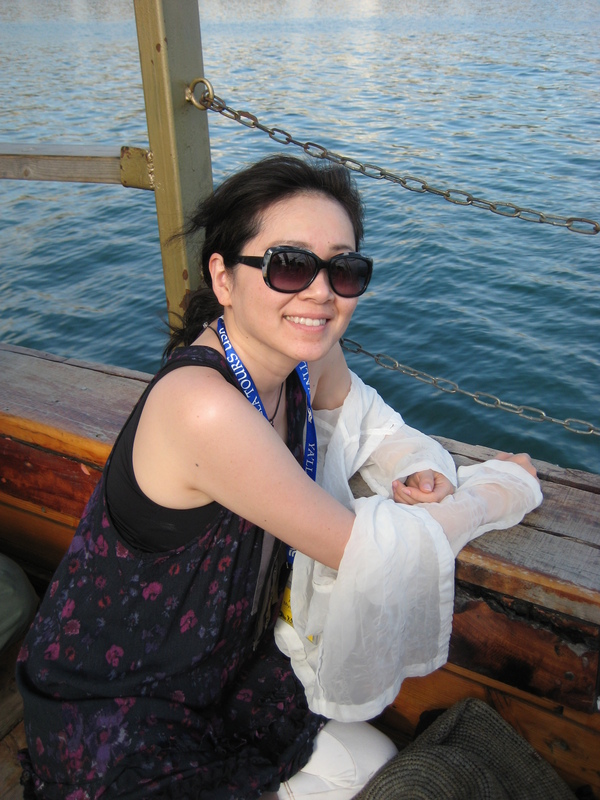 Even though it is a lake, not sea because I’m so prone to seasickness, I was uneasy about this cruise. Thank God, I did not get sick! It was very sunny and hot but when I was in a shade I felt so good. 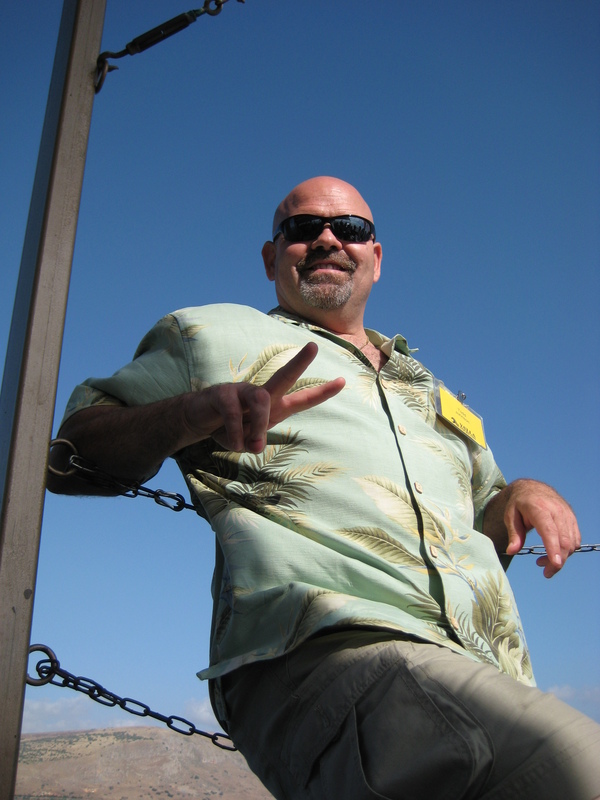 Todd also enjoyed boat ride. Hey, he looks like a Japanese with peace sign. They demonstrated fishing also but they could not catch any. 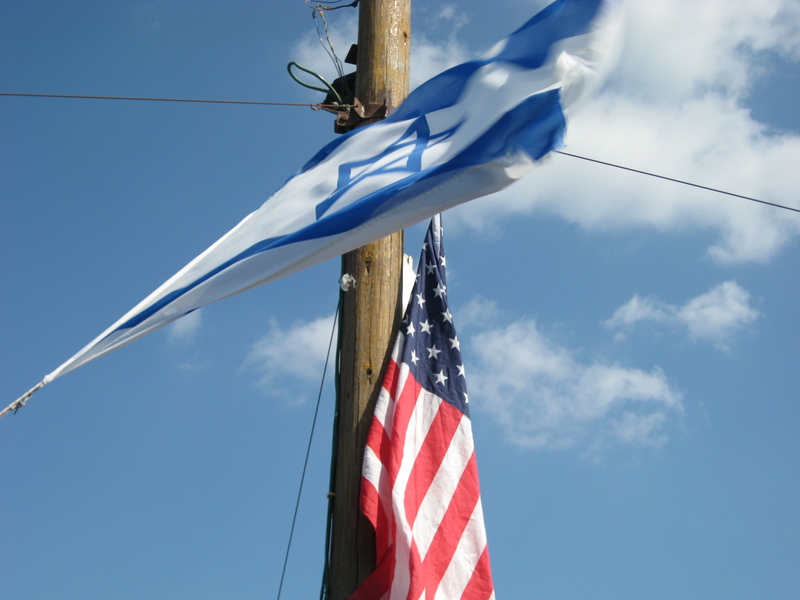 Since we were from America, they hoisted the American flag right next to Israel flag. Of course we sung a national anthem. I believe I was the only Japanese. They did not have Japanese flag unfortunately. 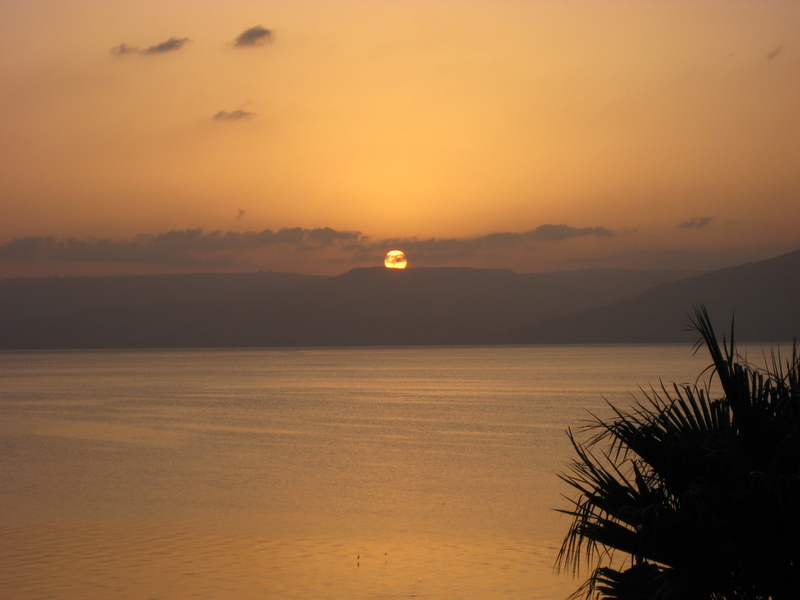 Sunrise from Sea of Galilee was very beautiful every morning. 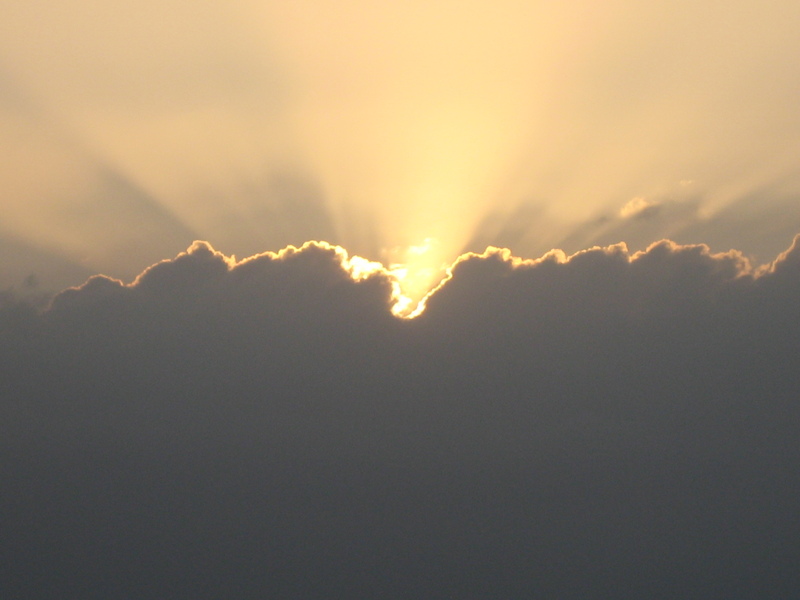 This divine sunrise was captured by Todd. I will report about Mt. of the Beatitude next. 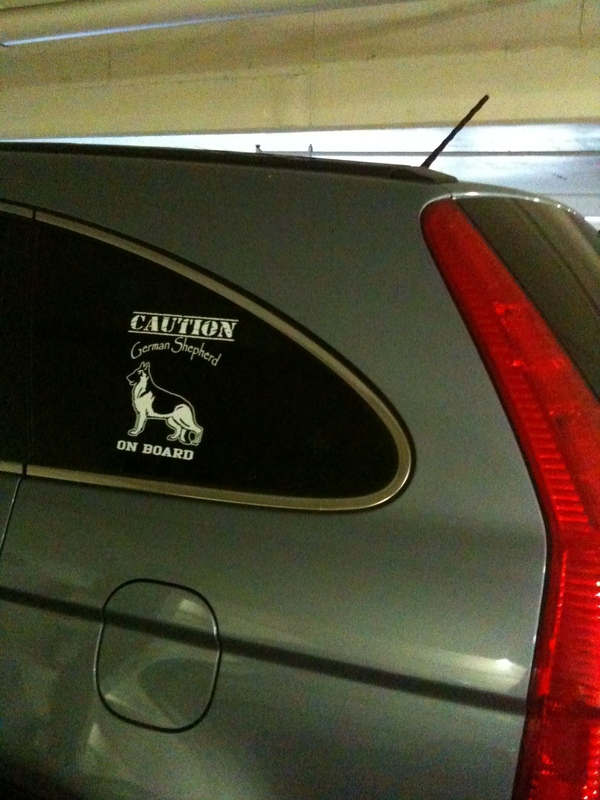 This is the first time I’m putting a sticker on my car. There is a good reason. Once I left my car at valet in front of a restaurant. After lunch I was going to pick up my car and saw a valet driver came out of my car his eyes wide open. Yes, I forgot to tell him that there’s a dog in my car. 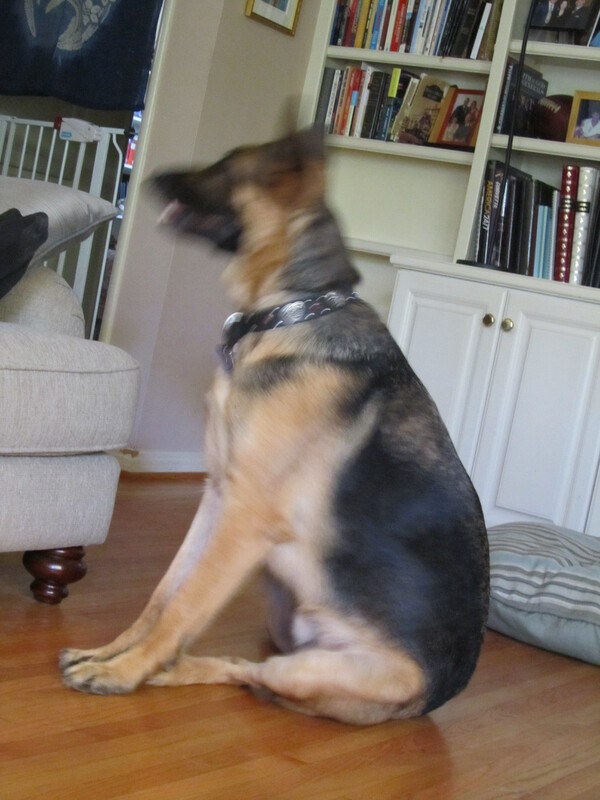 Kinta did not bark nor growl. Valet guy just saw Kinta lift his head through room mirror. He looked like he was going to have a heart attack and I felt really bad. Also in case a police officers stop my car, I want to warm them ahead of time. 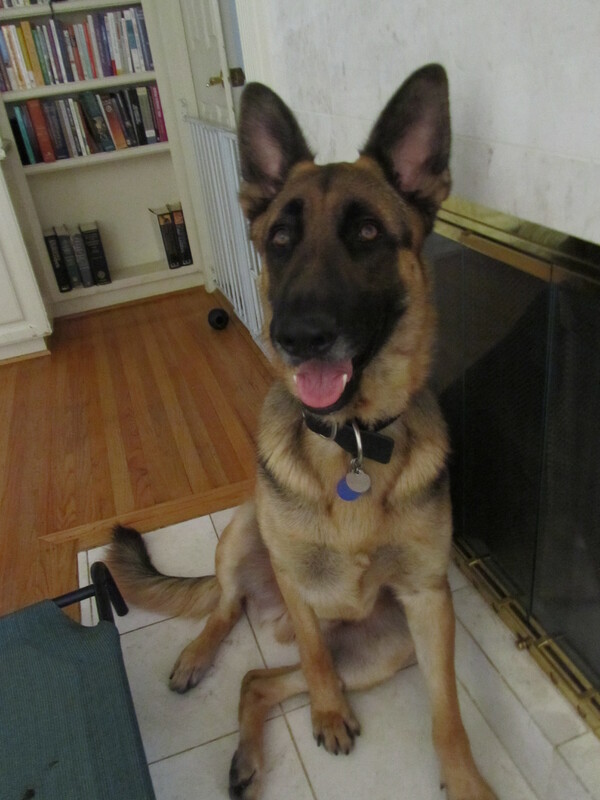 Because I know Kinta will go crazy as an officer approaches to my side. 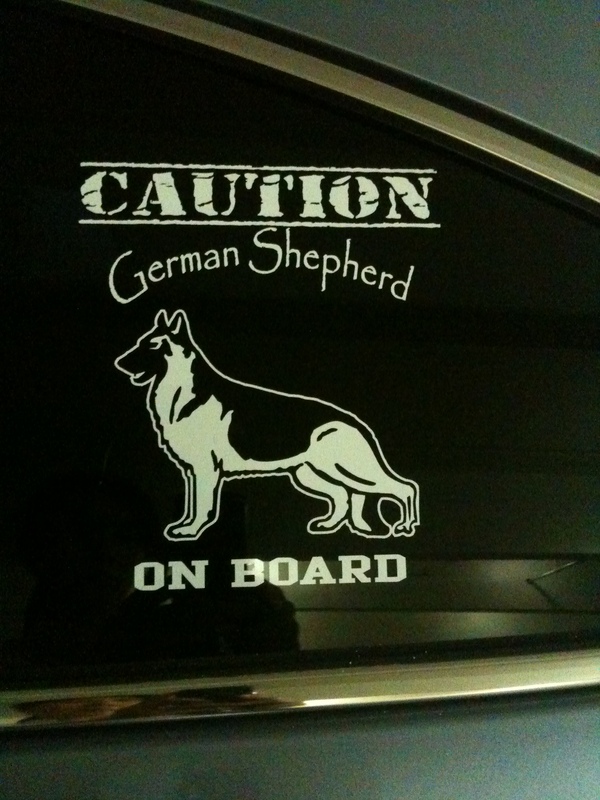 Well, I guess this sticker may help prevent someone tries to break in my car, too. 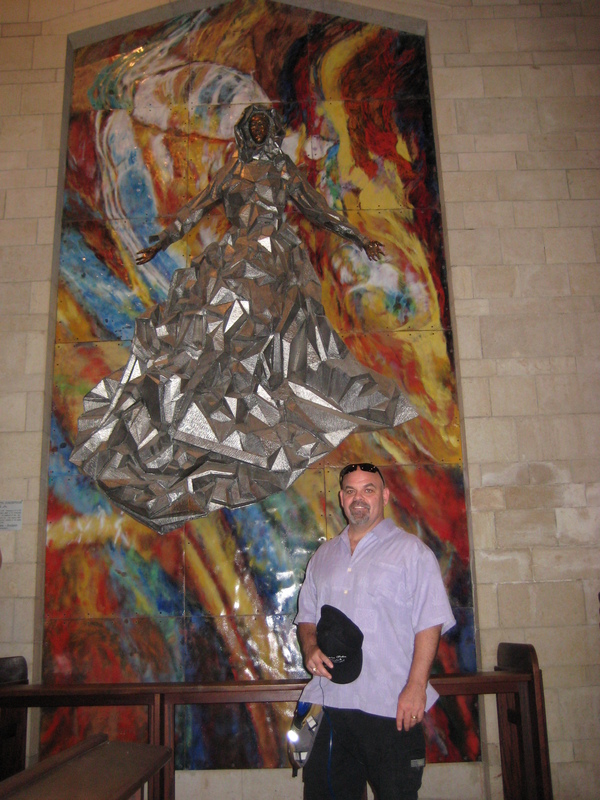 When we were in Israel one of the town we visited was Nazareth. 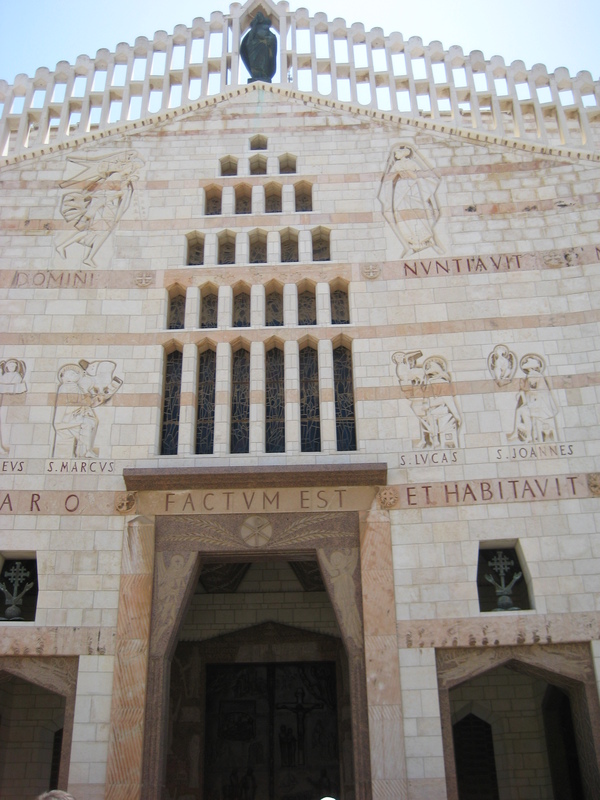 This is Church of the Annunciation. By Roman Catholic tradition, this was built on the Grotto of the Annunciation. 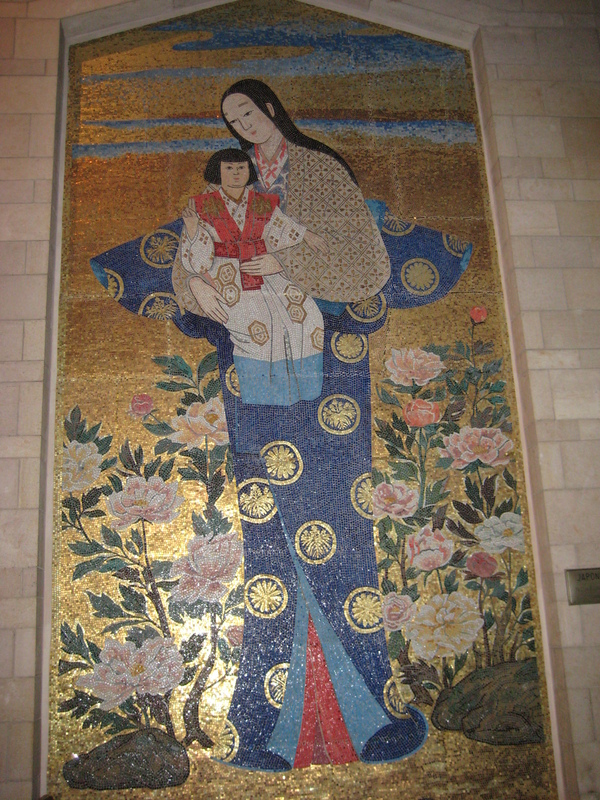 Second floor of the church is decorated with mosaics of the Virgin Mary donated by communities from around the world. This is from the United States. This mosaic filled with pearls is from Japan by Luke Hasegawa. Mary and baby Jesus are wearing Kimono. I had to iron so many clothes. 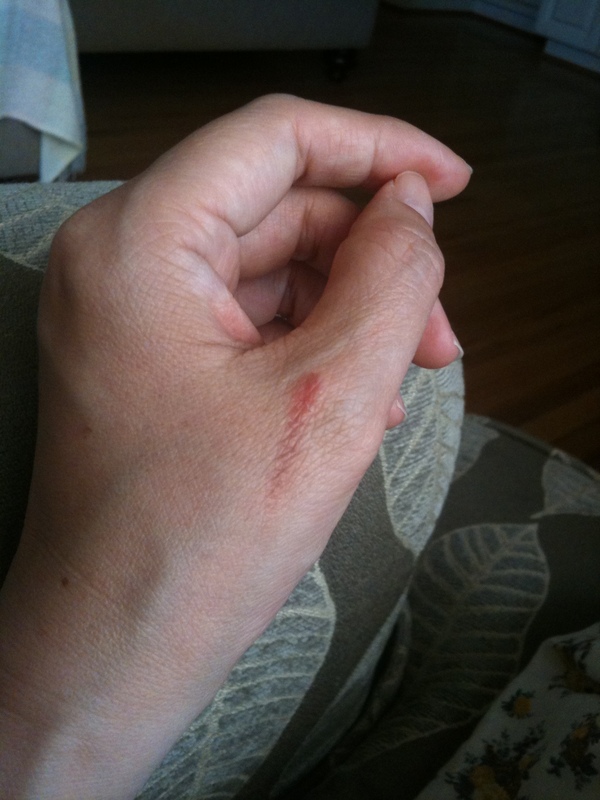 I end up burning myself. Ouch! I had a real bad migrain headache. 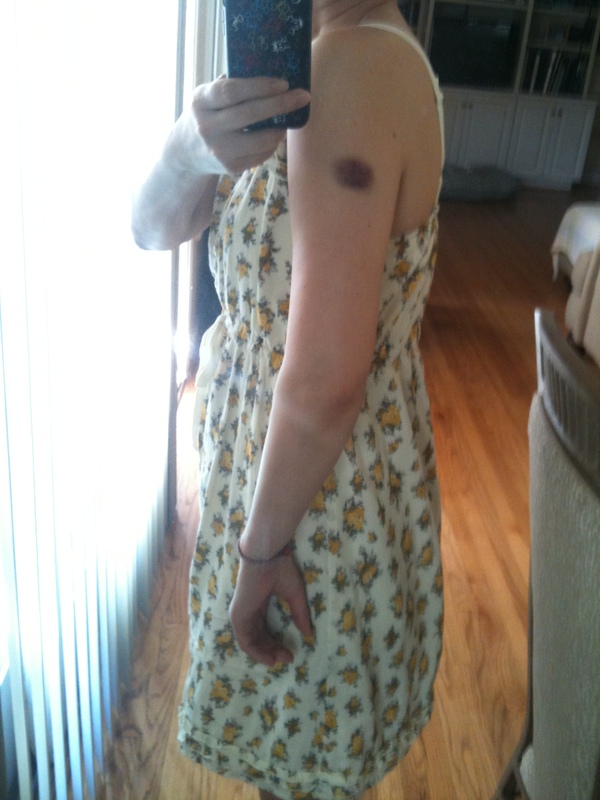 Todd gave me a shot and I end up getting bruises. Ouch. 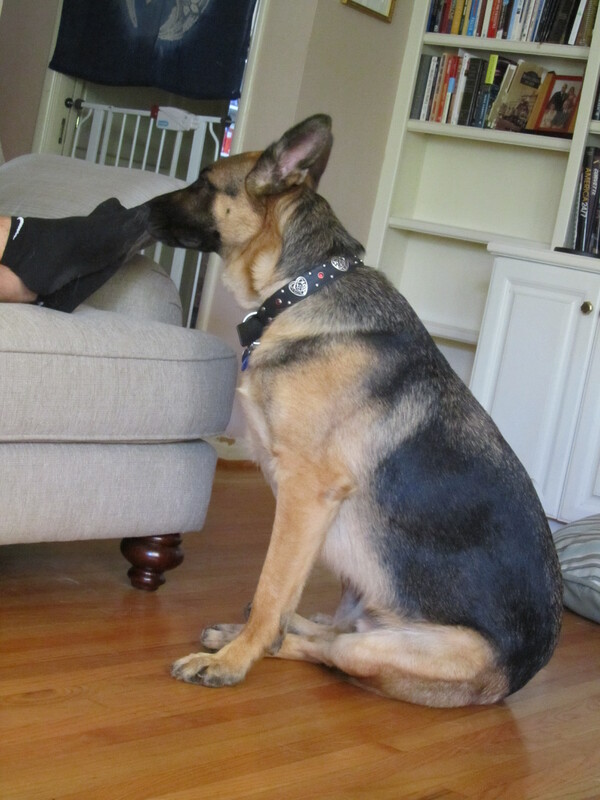 Why pooches always want to smell our feet? Especially our boys. They have to check our feet every day. “Stinky! !” You should know better. 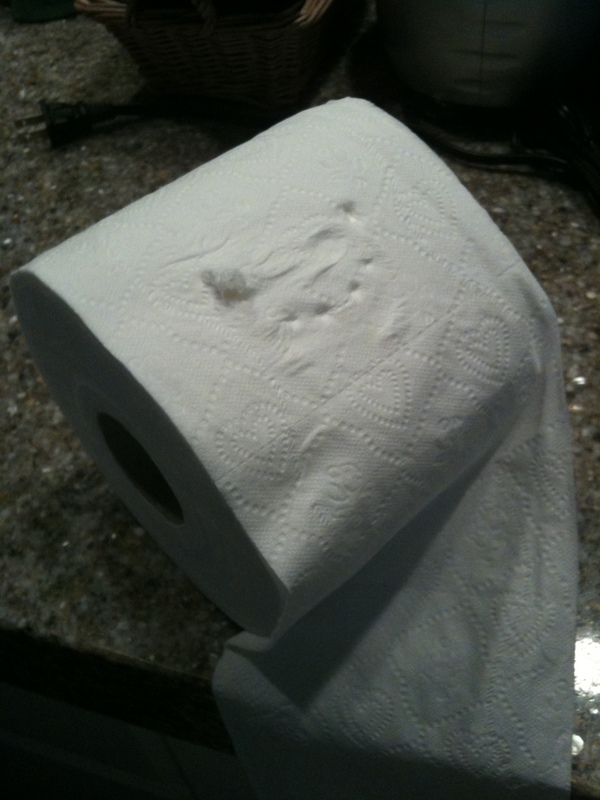 I was thinking about putting a new bathroom tissue and found one on a bathroom counter. Who brought this? No one but Kinta has big enough mouth for this. Thank you, but I rather you don’t. Todd and I have been to Holy Land. We went back to work right away but we appreciate this weekend to rest fully. 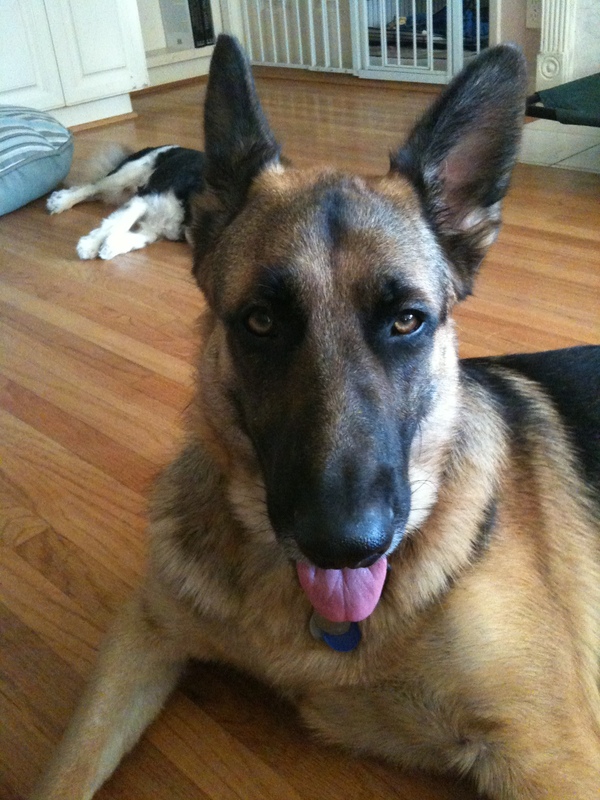 I’m hoping to start my dog blog slowly. I may put some pictures from Israel and Egypt here and there. While we were gone, Lauren was taking care of our pooches very well. Thanks to her TLC, Azuki put some weight. Kinta lost a little. Makiba gained a lot. 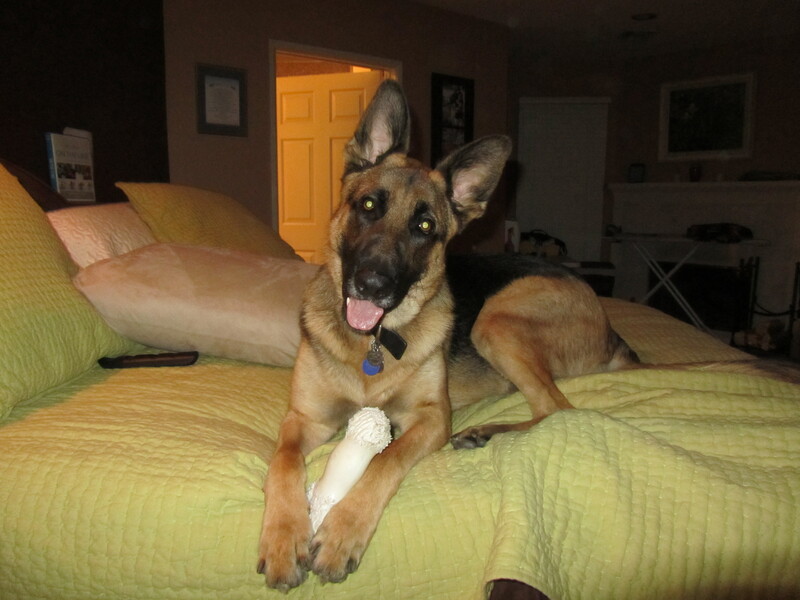 We’re happy to be back with our pooches. There is no place like home.